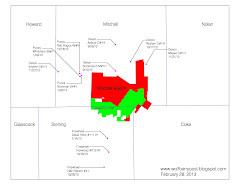 Lynden Energy Corp. (LVL) and CrownRock have spud their first Mitchell Ranch well. They expect to spud their second well in early July. Excitement is building as Thom Calandra from Ticker Trax wrote an article today highlighting LVL and says that "the company has a shot at leveling the plains here and making a bundle for its investors." Keith Schaefer of Oil & Gas Investments in Canada says that "the potential to create a lot of value quickly is there." The article also mentions that Daniel Rice of BlackRock Energy & Resources Fund is a big supporter and large shareholder of LVL. BlackRock and Pinetree Capital are some of LVL's larger shareholders which adds credibility to this company. Exciting news for this company!